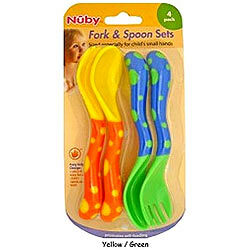 This is 2 Pack Angled Starter Spoon Fork form Nuby Cutlery Collection. When your toddler begins to show an interest in feeding themselves, having the right equipment is essential! Not only is it important to have utensils that are safe for your child to use, they need to be easy for little hands to hold too. These forks and spoons are designed with a soft grip handle that is perfectly shaped and comfortable for little hands to grip, helping them transition from weaning to independent feeding.